We were in the pretty, small town of Kastellaun in the hills of the Hunsrück for just a short time one morning. (Time for a walk around the town - and coffee and apple cake!) We had come from southern Germany the day before and stayed overnight on the nearby Moselle river. High up here they had had snow a couple of days previously and there were still remnants of the snowfall. This was 16th October. 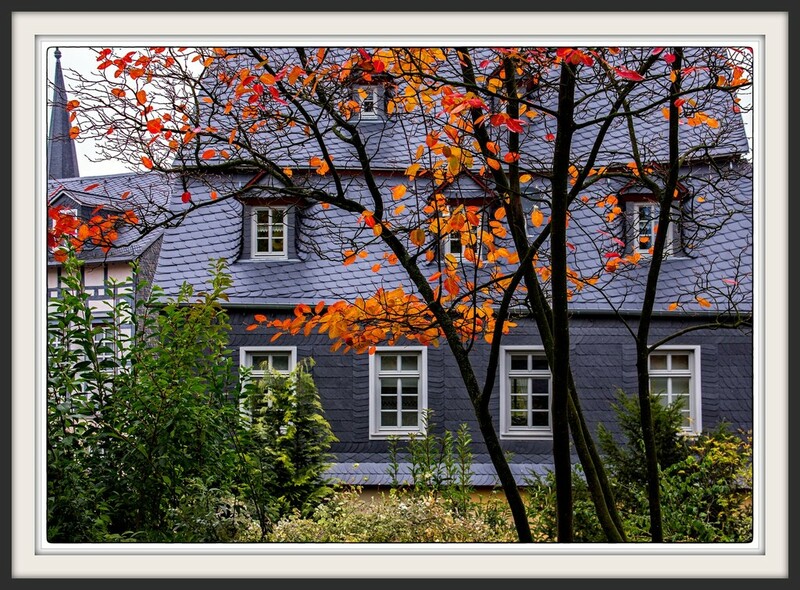 The grey slated house makes a wonderful backdrop to the black trees and the bright AUTUMN leaves ! Lovely image.Hunsrück is a beautiful part of Germany. How cheerful... and typically Germanic neatness! Great capture of this nice house and the beautiful colored trees in front .Fav. Love the architectural style of this building and the way it forms a perfect backdrop to those wonderful Autumn leaves. THe pov and framing is lovely. The contrast of color is just amazing!! Nicely detailed spots of gold against the grey background. Beautiful Autumn scene and house! Germany looks a beautiful place Tina and Ivan . Fav .